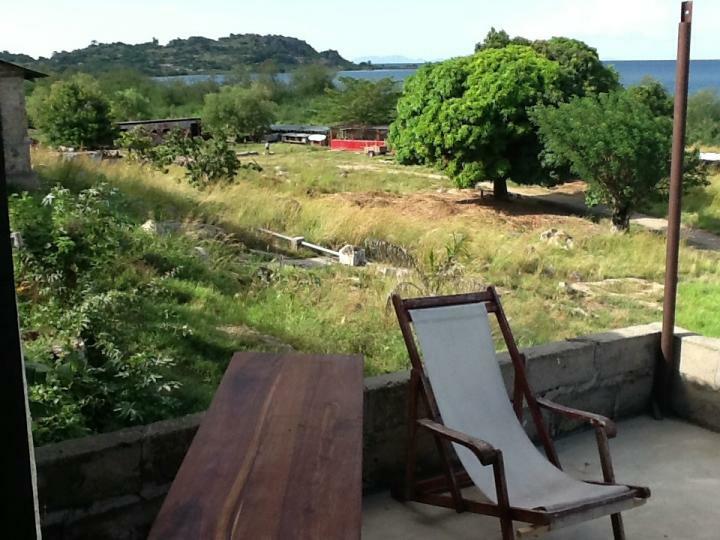 First impressions - the drive from Mwanza airport to Kitongo. It was dark as we set out in two cars from the airport, and the thing that struck me the most was that, on this unlit road, with a few cars driving at 20 or 30 miles an hour, were lots and lots of people: walking/running/standing on the side of the road talking - I couldn't figure out where they were coming from or going to. After a few kilometers, I began noticing that there were night-time marketplaces on the side of the road: they looked at first like shrines, each with little tiny stands of produce illuminated only by a candle in the middle of each little stand. People stood around in the dark, peering at the produce (I could only make out bananas and pineapples), and then I realized that many of the people walking along the road were carrying plastic shopping bags. It was 8pm, but our driver said dinnertime was 8:30 or 9pm. Sometimes next to the marketplaces, or other times near a bus stop we noticed little commercial areas: shack stores, with an open wall on one side, selling bottled drinks, or videos and dvds, or services - "Secretarial Services," barber shops--all dimly lit. I still couldn't figure out where the walkers lived, but there must have been houses or encampments tucked into the bushes and low trees on each side of the rooad. I also noticed long sugarcane on bicycles, milk cans stacked 3- and 4-high on the back of bicycles, on their way back from delivering milk to the "city." After 45 minutes or so, my eyes getting droopy, something woke me right up: we slowed down when we saw several armed guards at a checkpoint on a road--our driver explained that this road used to have lots of robberies. A little bit later, we turned left onto a very unpaved, rutted, bumpy 6.4km road. When that road ended in the middle of the JBFC "campus," it had been fully 33 hours of travel. Rice and beans were waiting for us in a very rustic guest house - concrete floors and walls, little geckos on the ceiling, no hot water - though the generator was on - electric light very dim; single, bare light-bulb in each room. We did a little unpacking and fell gratefully into our mosquito net-draped beds. Ellie/Mom Great descriptive writing...feels like I was on the road and in the guesthouse...but glad it was you instead of me! Gita Your description of being on the road reminded me of India a little bit, especially the sugar cane swaying on the bicycles. Hope you are settling in well. PS Though I find house-geckos a little creepy, in the end I welcome them because they help keep the room free of insects!